An irresistible sweet treat or savoury snacking after a stressful day might be the body’s way of telling us something. There are reasons that the body craves particular foods, but we sometimes cannot figure out exactly what they are. Our body sends different signals to the brain and sometimes the result is simply that we crave snack foods that are bad for us. If you reach for a sweet snack, this can be due to blood sugar level fluctuation. “As blood glucose (blood sugar) levels change throughout the day, the body tries to keep these levels stable. The feeling of happiness and comfort after consuming sweets or sugary foods or drinks is due to the fact that sugar releases endorphins in the body. The outcome of the ‘sugar high’ is overeating of high carbohydrate foods. “We tend to overconsume carbohydrates because they’re easily digestible and give us the same boost as sugar. However, if you are trying to kick your cravings, then moderate exercise is preferable to intense exercise. With intense training, carbohydrate and energy levels are depleted rapidly. No wonder that after a heavy work out, on the way home, all of a sudden you fancy a burger. Eating chocolate under stress can be automatic and it also generates the need for more chocolate. Chocolate can increase brain serotonin levels which creates the feeling of pleasure and happiness. This explains that why we can be easily ‘addicted’ to sugar or chocolate. 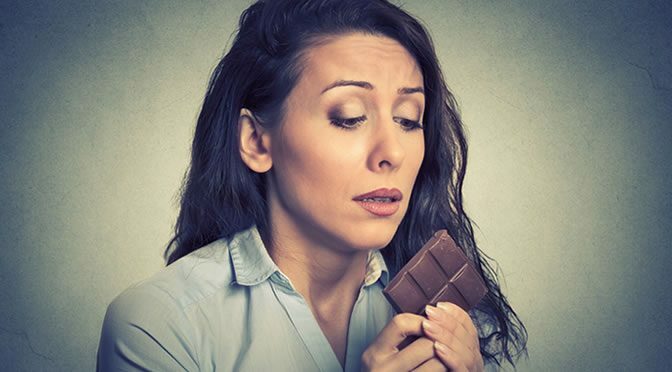 Craving chocolate can be due to hormonal changes in women, shortage in B vitamins or magnesium deficiency (chocolate is rich in this mineral). “It’s okay to have a little chocolate to subdue cravings. 3. What about fries and fast foods? Indulging or craving fries and binging on fattier foods when bored and stressed could possibly be telling us that our body is craving fat — but remember that not all fats are equal. “This could mean you’re deficient in essential fatty acids like omega-3s. There are also other type of foods, such as nuts and avocados, that are high in ‘good’ fats. Sudden strong desire for crisps, chips, pretzels or salty foods might be related to iron deficiency. Increasing the level of iron intake (in the case of iron deficiency) can help to combat salty snack cravings. Another idea is to drink a glass of milk, eat yogurt or dark leafy green salad. Also, during a workout or intense exercise we tend to lose electrolytes such as sodium, potassium and magnesium with sweat. Sweet potatoes, avocado, spinach, bananas and yogurt are rich in potassium. Celery, carrots, spinach, beets, meat and seafood are a neutral source of sodium and nutritious. Dark leafy greens such spinach and kale, nuts and seeds, avocado, fish, bananas and dried fruits are high in magnesium. Sometimes cravings can be managed by just drinking a glass of water. “We often misinterpret the signals our body is giving us. As a society, we are chronically dehydrated (Just so you know: thirst is actually the last resort signal for dehydration). The next time you reach for something sweet or salty try quelling the craving with a tall glass of water. Cravings for vegetables such as kale or broccoli may be a signal that the body lacks vitamin C, iron, calcium or magnesium. Craving for a healthy diet! Craving a food and indulging in moderation is not strange but the important thing is a balanced diet. “Think about the last time you consumed foods in every single color.